The Zest has to be the most promising car to have rolled out from Tata Motors. From Bert's road test we glean that it's definitely a car worth considering. Tata should get credit for creating the compact sedan segment but in the time it's taken Tata to bring the next generation, the Honda, Maruti* and the Hyundai have gone on sale and turned out to be instant hits. Together, these three cars contribute a huge chunk to the total passenger car sales in India. An intensely competitive segment like the hatchback space already, more compact sedans are expected. The Tata then, is the latest entry and is expected to be rolled out any time now. Should the competition be worried? The Zest is an all-new design and not a booted Vista. Every panel is different and the overall design has a lot more character. The front, especially due to the first in segment projector lights, looks more premium than its well-established rivals. But the Amaze and the Xcent are actually more balanced designs and they're more sedan than notchback in proportion. This is a surprise because the Tata was actually designed as a sedan first and then as a hatch. The Zest is based on the older Vista chassis so it starts out as a large car for a compact sedan. From the side, the stubby Tata rear looks more odd than the Dzire's and a longer bootlid on a larger boot would have improved the looks considerably. But the 4m regulation removes that option from the table. In its details though, the Zest does quite well for itself. The multi-spoke alloys look better than the boring designs on the Amaze and the Dzire and the 15-inch wheels fill the Tata's wheel wells nicely. Rear-on, the Zest looks smart with wrap-around LED tail lamps that are not fully in sync with the front but certainly stylish. All the cars have a chrome strip above the registration plate but the Zest's rear is definitely better looking than the boxy tail of the Xcent. Step inside the Zest and you'll be greeted by a pleasant new design. The dual-tone dash is modern and thoughtfully crafted with unprecedented attention to detail for a Tata Motors product. It does make the Zest feel more special and the fit and finish has also come a long way and is in many places at par with its rivals. The whole cabin feels fresh and is clearly the most current design. It even makes the Amaze look boring with its piano black and silver accented materials. Even the steering wheel is the same - more appealing than the others. All the cars here offer steering control that feel built to last and the Xcent and the Dzire even add back lighting. 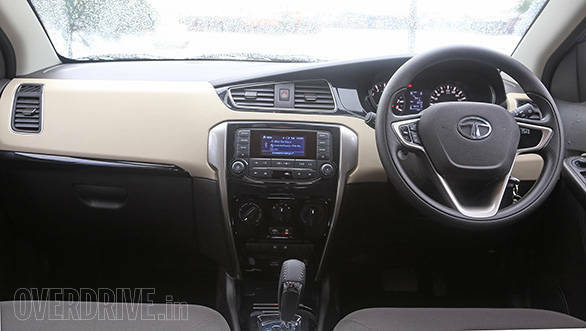 What doesn't work for the Zest are the few parts that have been carried over from the Vista and the Manza and these do not match the new style and quality of the dashboard. Harman supplies the stereo in the Zest and the one in our test car is a notch below the spec of the top diesel and petrol models. But it matches its peers here - all top models - feature for feature. But despite the Harman name, it sounds like an OEM audio system is expected to in this class of cars. 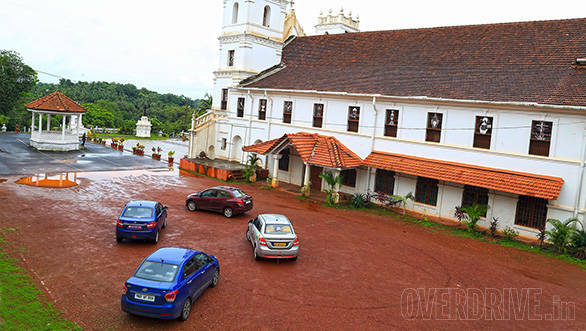 Tata's cars have never lacked space and the Zest has a lot of it too. Headroom is impressive across the board and tall drivers will not complain. The others are hardly slouches in this area but the Zest offers more. Shoulder room is also impressive - it is the widest car in the segment - but the middle row is compromised by the transmission tunnel, a direct result of the old Vista chassis. The Grand i10-based Xcent is the narrowest and despite impressive knee room and a flat floor will find it hard to take on the fifth passenger. The Hyundai does have the only rear AC vent in this test though. The Amaze has the best overall space but its front seats will tire you more on a long drive - the Zest and the Dzire both have better bolstering. The Hondas integrated headrests are taller than the Xcent's but the other two offer adjustable headrests. Now to the rear seats. Knee room at the back is excellent in all three cars but the Dzire loses out a bit - it's like the Swift in this regard. In our books, this is a big negative for the Maruti. The Amaze is spacious and accommodates the fifth passenger graciously with a flat floor. The spacious Tata has equipment issues - there is no rear armrest and such a paucity of storage spaces that you'd think the development team forgot entirely to add these in. Up front, the Tata has one cup holder ahead of the gear lever and a 12V socket occupies what could've been the second one. The door pads, again, are large and capable of holding two bottles each but don't actually have proper bottle holders, which you get in the Honda and Xcent even in the rear door panels. Then again, the Zest bests the Dzire's wee boot with 360 litres of space and useability. 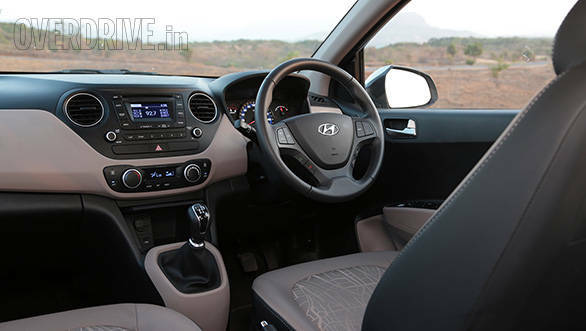 All said, the Zest is spacious and the interiors look great for the most part. Where it loses out is on being a useful car when it comes to storage spaces in both rows. The Amaze and the Xcent also offer bigger boots as well as spacious, better equipped cabins. The Zest diesel uses the same Fiat-sourced Quadrajet but with a variable geometry turbo. It's a proven motor and it suits the Zest fine. Is it noisy? The question comes from the Amaze's i-DTEC engine which was promising on paper but has a few NVH control issues. Every time I drive the Honda, I wonder why it isn't quieter. The Mobilio's cabin only bolsters these thoughts. 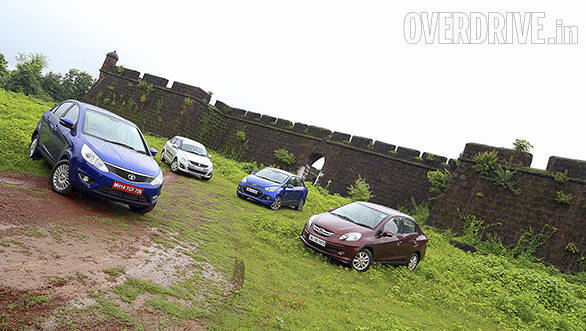 The Zest's Quadrajet is more refined but it's the Xcent that has the best refinement levels. 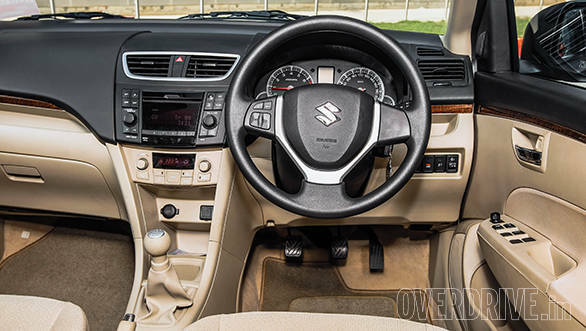 The Dzire and the Zest have reasonably quiet cabins but you'll know that you're driving a diesel from inside. The Quadrajet - 90PS of max power and 200Nm of peak torque - is bested here only by the 100PS Amaze. The Dzire and the Xcent make much less - 75 and 72PS respectively. But what happens in the real world? Our test Zest came with the optional five-speed automated manual transmission (AMT). 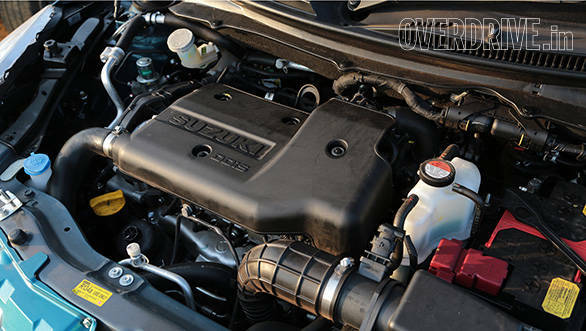 On the road, there is very little turbo lag and the power is linear, quite the contrast to the Manza, its motor-mate. It is effortless and uses all the torque it has quite well, but spirited the Zest is not. But the Amaze is better at this. It feels more torquey, there is hardly any turbo lag and its acceleration is still the best in class. Honda, of course, restricts the top speed to 140kmph and the engine is restricted to 4,000rpm in top gear. The AMT is convenient, but it does slow down the Zest with its slower shifts. 100kmph takes 17-odd seconds which is the slowest here. The manual transmission would be much quicker and we expect the manual diesel Zest to be able to keep up with the other cars. 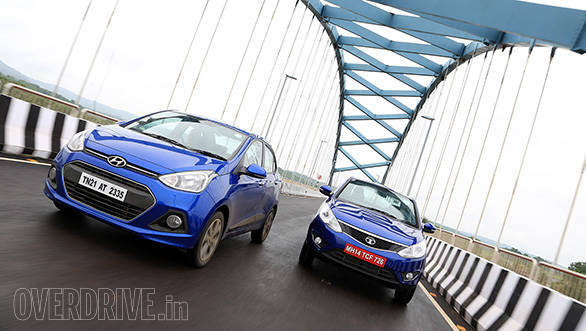 The surprise is that the Maruti and the Hyundai shrug off their output deficit on the road. The Maruti does have some turbo lag but once its spinning, the 5-speed manual helps propel the car pretty quickly and swift progress means staying in the zone - with more gear changes if necessary. The Xcent is the real surprise because its small triple cylinder engine is quite peppy and manages to handle both town and highway easily. It holds high speeds effortlessly and never really feels like the least powerful car here. It also has the i10-style conveniently located gear lever and the best shift quality on test here. On the Zest AMT, you don't need to actually change gears but you can move the lever to the left and shift manually to make gear changes a bit quicker. 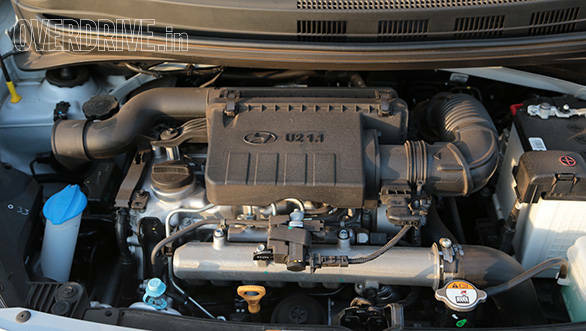 Sports mode also forces the engine to shift at higher revs in automatic operation for a spring in the Zest's step. 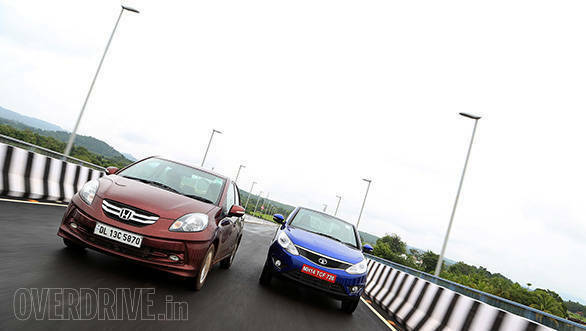 Economy is still the Honda's forte although the Zest AMT followed closely withthe Maruti and the Hyundai trailing. But the gaps between the four aren't large but in this segment every decimal place counts. 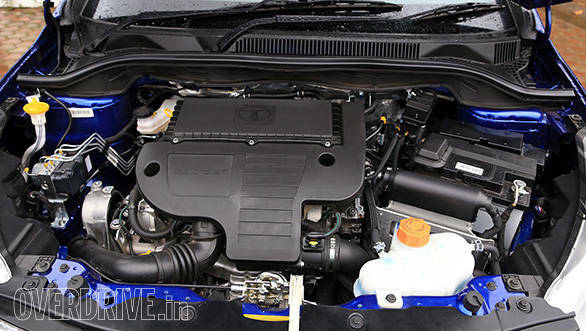 We were surprised at the Zest AMT's efficiency as well as the improvement in the engine's power spread and refinement. The Honda still has the best overall powertrain characteristics apart from the NVH and the Xcent remains the small one that surprises. All these sedans have hatchback siblings and therefore you get the near-standard MacPherson unit at the front and a torsion beam setup at the back. But the dynamics are very different. The Zest has the best ride quality. Suspension works rather well over broken roads while the wider track helps give it stability. Body roll is controlled and as Bert noted, you can actually have a lot of fun with the chassis around the corners. 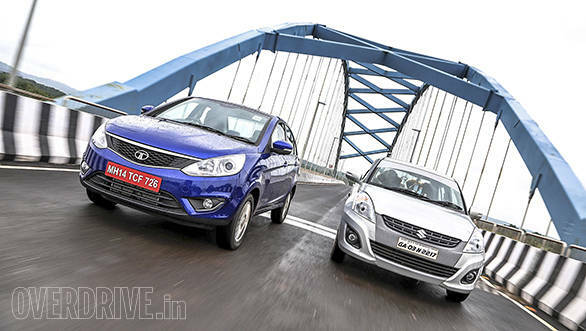 The diesel is definitely nose-heavy compared to the petrol Zest - but that isn't just a feature of the Tata in this test. Considering it is electric-assisted, the steering returns reasonably good feedback. The best handling car in the segment remains the Maruti. The Swift's DNA proves to be hard to beat and sitting on the same exact wheelbase helps. The setup is balanced between stiffness and softness and the steering is precise too. Ride quality has been the weakest link in the Dzire and that could be better. The Hyundai and the Honda offer a better ride and the extra insulation of the Xcent cabin makes road noise more distant too. Hyundai has tried to weight up the steering a bit but the vagueness is still there. The Honda chooses a light steering for effortless city work but as speeds increase, you notice the precision but wish there was a little more weight. Brakes, then and the Dzire has the best feel with well-tuned ABS. The Xcent has sharper brakes than the rest but the ABS is also more sensitive. The Amaze and the Zest fall somewhere in the middle with the Zest feeling its extra weight under heavy braking. Shortest stopping distance though? You'll be Amazed, let's say. Overall, the Zest has found a likeable balance between good ride and enjoyable handling. But the Amaze is actually the best balanced package overall. The Dzire remains the driver's compact sedan while the Hyundai is competent but the least involving to drive. The Zest will be launched on August 11, 2014. But we expect to see three trim levels. This AMT version will only come as the middle model - standard ABS, no airbags, lower-spec Harman stereo and projector lamps. The top diesel will have the manual gearbox but add two airbags, daytime running lamps, the touchscreen Harman stereo and more. In this test, all the cars offer the basic comfort features but the newer ones bring segment-first features. What is still missing is a reverse camera and OEM-installed navigation. Tata says the Harman system can be extended to offer these features in some future model. The usually feature loaded Hyundai is well-equipped. Its top variant has the reverse camera, rear AC vent, keyless entry and ignition, cooled glovebox and a gigabyte of music storage built in. The Maruti (ZDi) in comparison is spartan but an update expected later this year should fill in the blanks. But the Honda, actually, has the least appealing feature spread. 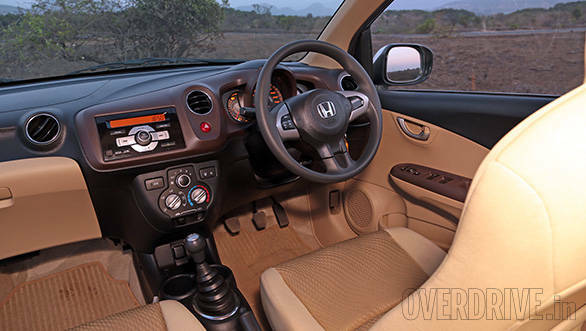 However, we give Honda full credit for never shortchanging the safety spread so all variants get ABS and the top two Amazes also get dual airbags. Which means if safety is a priority - and it should be - the Amaze SX is the most cost-effective way to get an airbagged compact sedan in India right now. A compact sedan should feel like a step up from a premium hatchback. The Maruti Suzuki Swift Dzire is the best selling car in the segment. It is great to drive, performs well but has traditionally not had the strongest feature suite and clearly lacks boot as well as rear seat space. From this perspective, its position as the market leader in the segment can be hard to explain. It clearly shows what a bigger dealership and service network, reputation for affordable ownership as well as reliability and resilient resale values mean to the car buyer. Forget those last bits and the Zest is actually the better car. There is more space, it looks better both inside and out and the features are thoughtful and largely well-executed. If you've been looking for a diesel automatic, the Zest is your car and we expect the AMT to be priced just above the manual mid-variant to boot and directly opposite the others' top manual trim levels. The Amaze then continues to tick the box for the top car in the segment today. Its victory over the Xcent might be by a small margin. The Xcent offers more comfort features, noticeably better in-cabin refinement and that rear AC vent to entice the chauffeur driven as well. But the Amaze's success hinges upon its best in class overall space, the best performance as well as fuel economy from that admittedly throaty diesel engine, rounded off by the best spread here of standard safety features. 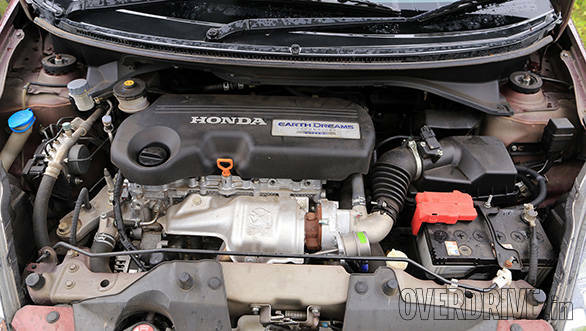 The battle is getting closer and more fraught but the Honda, for now, is the best diesel compact sedan on the market. But this story isn't so much about the Amaze as it is about the Zest. That we could find the Zest easily comparable to the others in the segment makes Tata Motors a winner. The car still has some ground to cover before it can surpass the Amaze and the Xcent, but that is no longer an impossible goal. The last time we conducted this comparison it was a close run thing and it's just gotten even closer no thanks to the Zest. Tata Motors just made your choice that much harder!